Lisa loves John: Weekend Happenings! 1 | This weekend was absolutely gorgeous weather. It was sunny and in the high 70s and low 80s all weekend. I mean really, it feels like full on summer here, and I am not complaining! 2 | Since the weather was so nice, John and I decided it would be a good idea to lay out by the pool and get a little sun before Blake and Ginna's wedding this weekend. However, after only an hour, we turned into Mr. and Mrs. Lobster. It's bad - I'm just hoping my arms get through the peeling by Friday... (sorry in advance to the bride and groom!). 4 | It was nice getting to know some of John's coworkers a bit more and chatting with everyone. Scout was invited and joined, but after only 10 minutes, I took her home... She was eating whole crawfish off of the ground, and it was totally nasty digging claws out of her mouth. 6 | Also, have you tried the new "Oprah" chai latte at Starbucks? It is really good!! It's a bit spicier, and the flavor is way better than the normal chai... and fewer calories too! This will def. be my new go-to drink for awhile! 7 | Sunday evening, I took Scout to the dog park for a bit. We haven't been going as often as we did when she was a puppy... I feel like there are a lot of dogs that are pretty rough with her, and although they aren't necessarily being aggressive, I don't think Scout has much fun getting beat up on. She would rather sit and take selfies with me on the bench! She's quite photogenic... look at that model stare! 8 | I'm co-hosting a baby shower for a coworker in a few weeks, so I spent quite a few hours cutting out paper onesies. I found a ton of super cute paper at Hobby Lobby for a good deal, so I bought a bunch - we will see if my fingers can stand cutting it all! 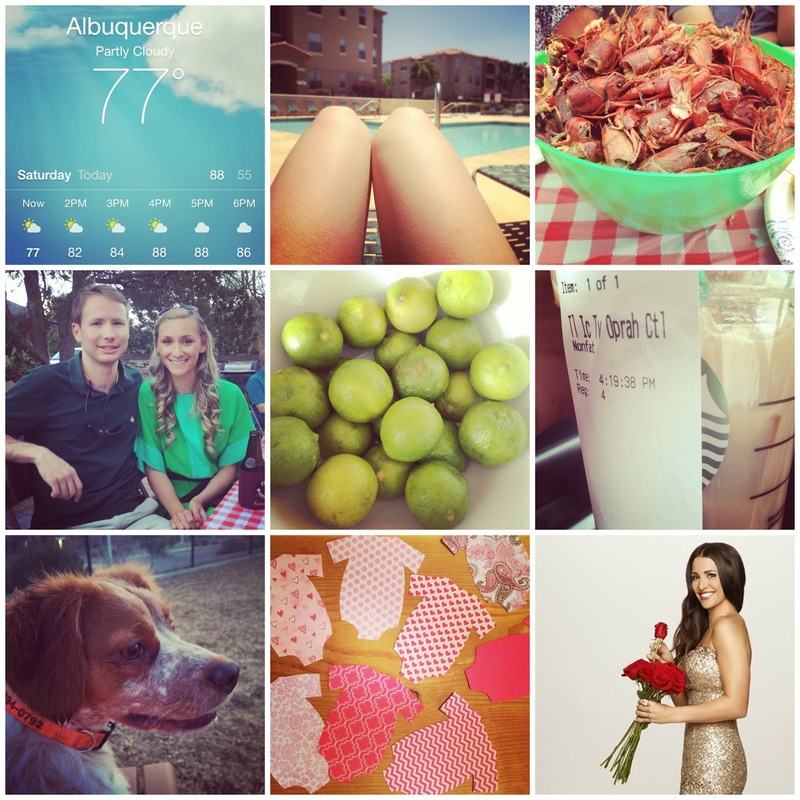 9 | This doesn't really have anything to do with my weekend, but I am pretty excited for the new Bachelorette tonight! Will anyone else be watching?! I didn't really enjoy Desiree or Juan Pablo's seasons, so I'm hoping this one will be worth watching. Oh I am definitely ready for The Bachelorette tonight (and I'm hoping it will get me hooked on the series once again, since I had to give up during Juan Pablo's season). Looking forward to seeing that key lime pie recipe! Definitely watching the new season starting tonight!! Can't wait!! I loved your hair for the crawfish boil!! Yay for a fab weekend! And I'm pretttty excited for Bachelorette. Hope "eeess" an "okay" season! Looks like you had an awesome weekend! Yum key lime pies! I'm going to have to try the new Chai, chai lattes are my usual go to and I noticed that this one had popped up but I was nervous to sway from my usual, glad to hear it's tasty. I'm so happy you explained the oprah chai! I've been wanting to try it, but thought it was the same chai but more money! Happy Monday! What an awesome weekend! So jealous of your nice weather-- we went from warm to cool and I hate to complain, but after having 80s and 90s, going back down to 60s seems chilly! Those little paper onesies look so cute! I love seeing what creative DIYs people do for wedding and baby showers! Looks like a beautiful weekend!! i love love love key lime pie, did you get that i really really love it?? especially with freshly squeezed key limes, yum! and the bachelorette tonight, yes! Good for you for lasting 20 minutes eating crawfish! I did not do as well. :) I'm definitely going to have to try that new chai latte! Those onesies are super cute too. Glad you had a good weekend! I wanted to make my own thank you cards for my baby shower. So I cut out 40 tiny onesies to paste on top of the carstock. My goodness, I was over it around the 5th one. Good luck! I'm jealous of your pool! Yay for good weather! mmm i could for a key lime pie! I love your green dress in that picture above! I got a little sunburned this past weekend as well. I wasn't outside that long either. Boo to sunburn! Can't wait for the recipe and I haven't had a chance to try it yet but definitely want to! I just love your weekend recaps. I've got to start taking more pictures! Crawfish would totally gross me out too and I can't believe Scout was eating them! I'd probably freak out my dogs would get choked or something crazy! My dogs aren't too crazy about dog parks either. Every time we take them, they hang out under the bench with us. And chai lattes are my favorite so I will definitely be trying this new one! So much goodness!! Can't wait to hear about the key lime recipe and I need to try the new chai tea at Starbucks - I didn't even know there was one! Yay for beautiful weather and the return of the Bachelorette tonight! I'm definitely excited for the bachelorette! I pretty much hated last season, but Andi should be super cool. Plus, she's from my hometown ATL. Yay! What a great weekened! I'm jealous of the nice weather your having! We've had a couple nice days but overall still chilly here in MI! :) I totally watched the Bachelorette last night! I love Andi! Some of the guys already seem like tools. Lol. I'm looking forward to the season though! Oh yum! They look so delicious! I can't wait to make these! Thank you for the recipe dear. :) PS. I am sending you an email! Looks like another amazing weekend for sure!! And just watching Bachelorette now...I love Andi!